It's easy to think that "stocks" means "do I buy a share in GM or GE?" In fact, the stock market has been around a long time, and like any other business they have come up with a lot of products to get your money. To understand the stock market at all, it's important to first understand indexes. An index is some sort of average of the price of many stocks. Indexes are important because we calculate risk relative to indexes, and we calculate our gains and losses relative to indexes. If our stock goes up and down twice as fast as an index, we say it is twice as risky an investment. If we own some stocks that go up 10%, and the indexes went up 10% at the same time, then we shouldn't think we're brilliant investors, instead we say "a raising tide lifts all ships." Why do we use indexes? Any individual company can have a bad quarter, or a bad year. An entire sector can have a bad year. But if you track a lot of stocks, then it's thought that you are somehow tracking the economy as a whole, rather than one or two particular companies that may be doing particularly well or particularly poorly. All the stocks listed are large US companies, and there are only 30 of them. Some would complain that this means the Dow is not a very diverse index. To satisfy such people, there are other indexes. How has the Dow performed? We'll look at the value of the DOW for the last 100 years, and for the last 5 years. As you can see above, over the last 70 years the Dow has done quite well. There was a rather striking "adjustment" starting in 1929, with the Dow bottoming out in 1932 and not fully regaining its previous high until 1955. 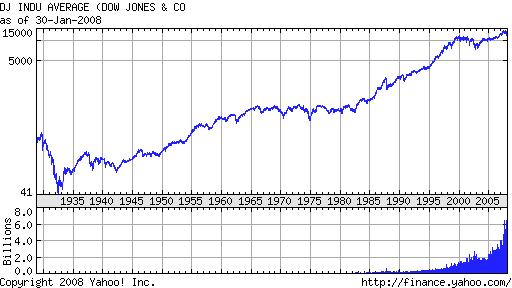 However, as you can see neglecting minor "blips" the Dow has been on an upward trend pretty much non-stop since 1932. It's also true that the Dow did very well from 1950 to 1965, was more or less flat from 1965 to 1980, did very well again from 1980 to 2000, and has been more or less flat since 2000. Of course, if you go see a broker they will tell you how their funds performed from 1990 to today, which includes the big stock run up of the 90s. They are less likely to tell you how they did from 1999 to 2001, as it's a near certainty they lost value during this period just like everyone else. A broker will naturally chose a time period that makes him look good. In the five year chart, we see that 'more or less flat' includes a dip where the Dow lost about 1/3 of its value. If you had gotten nervous and sold your stocks in September of 2002, you would have been doing yourself a huge disservice and someone else a big favor. On the other hand, if you had been prescient enough to sell in May '01, bought everything back in September '01, sold again in March '02, bought it back in September '02, and then held until January '04, you would have nearly tripled your money in three years, a return of about 40% per year. But no one is this good, don't even think about it. These charts show you two important things: if you put a bunch of money in a diversified set of stocks and let it sit for 25 years, you will do quite well. If you put a bunch of money in a diversified set of stocks and take it out a couple years later, you could make money, break even, or lose your shirt, depending on which particular couple of years you happen to pick. The Standard and Poor's 500 index is made up of the 500 largest companies in the US. Because the S&P 500 tracks 500 companies instead of 30 companies, it is called a broader index, and is thought to better represent the US economy as a whole. There are three major, separate stock markets in the US - the New York Stock Exchange, the American Stock Exchange, and the NASDAQ 'over the counter' stock exchange. Companies listed in the NASDAQ exchange tend to be smaller or newer companies, and include Microsoft. 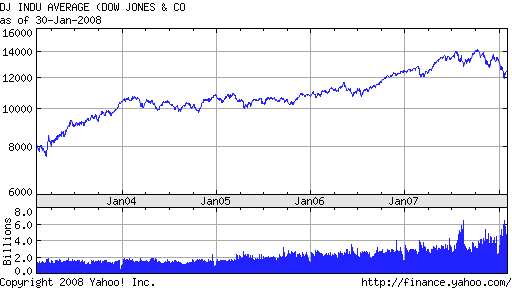 The NASDAQ index tracks the price of 3000 companies listed on the NASDAQ exchange. There are many other indexes of the US stock market. The must popular are the S&P 400 mid sized companies, the S&P 600 small companies, the Russell 2000 small company index, the Russell 3000 index that covers 98% of all the money in the stock market, and the Wilshire 5000, which actually covers all 9,000 plus stocks that are sold. There are at least 39 other major stock markets that are not in the US. These include the London Stock Exchange (FTSE 100), the Japanese Stock Exchange (NIKKEI 225) and the Hong Kong Stock Exchange (Hang Seng). In the 1900s it was perhaps reasonable to focus on the US stock exchange, but in the 2000s many of the world's fastest growing companies are not in the US.